When I began coaching in 2005 I would take other coaches’ strength progression design and apply to myself and athletes. I’d do what was printed, and find things that worked, and others that didn’t. Next, I began to combine what worked from one coach, with what worked from another coach, into ‘hybrid’ designs. Finally, after a few years of this and with a solid grasp of the theory behind strength session design, I began designing my own progressions from scratch. 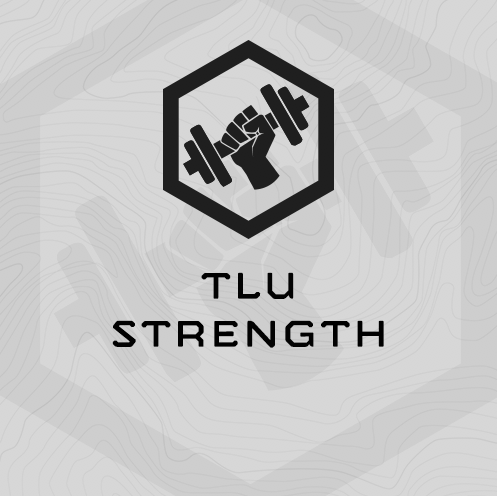 “TLU” Strength Session Design is the my first “original” strength progression design, and is the best strength programming I’ve created for “hybrid” mountain and tactical athletes who must also train other fitness attributes … endurance, work capacity, chassis integrity, climbing, etc. “TLU” stands for Total Body, Lower Body, and Upper Body. Within a TLU strength session, each component is trained (total, lower, upper) but with a differing intensity (loading) and volume (reps to per set and total reps per exercise). While we call it TLU, the session’s alternate the order evenly throughout a cycle (UTL, LUT, etc). For the first exercise, you will find your 1RM, followed by 5-6 Rounds of 2x @ 85% of 1RM. This is a heavy load, and total volume is 10-12 reps total. The second exercise uses 6 rounds and 3-5 repetitions (18-30 reps total) at a “hard but doable” weight. It’s paired with a explosive body weight movement similar to the movement pattern of the lift, completed immediately after finishing the lift. A mobility movement finishes up the round and doubles as the rest period. The third exercise has the highest volume, with 6 Rounds and 4-10 repetitions (24-60 reps total). Again, this is paired with a body weight movement and mobility for each round. TLU progression is a way to train strength frequently, without overtraining. But best of all, TLU sessions are fun! There’s lots of variety, we add complex training to develop power and athleticism, and the entire body gets strength trained in one session. This is a 6 week, 5 day/week strength-focused training program deploying our TLU strength methodology. You’ll train strength 3 days/week, Monday, Wednesday and Friday. On Tuesdays, you’ll complete a short, intense gym-based, multi-modal work capacity effort, followed by a Chassis Integrity circuit. On Thursdays you’ll complete a mid-distance 3-4 miles easy run, followed by a low-back focused chassis integrity circuit. Anyone who wants to dedicate 6 weeks to building strength. We’ve deployed TLU programming with Special Forces, professional mountain athletes, office workers and high school sports teams. It’s awesome strength programming! How Long should the strength sessions (Mon, Wed, Fri) Take? How long should it take to work up to my 1RM? What does “Increase load rapidly each round until hard but doable” mean? 5x Walking Lunge – increase load rapidly each round until 5x is hard but doable. 2x Jumping Lunge - Be Explosive! 2x Burpee - Be Explosive! "Just a quick shout. The new TLU strength program you made is great! Loving the strength gains without the loss in endurance. I can walk right into a 5 mile run and complete it in under 40 minutes without straining. Same with weighted rope climbs, pushup/situp events, etc. Thanks again for the great program." "I wanted to say thank you for all of the work you and your team have put into your programs. I just recently finished the TLU strength program and I had great results with it. I have been in EOD for 12 years with multiple deployments to Iraq and Afghanistan and I have spent most of my career researching and trying different fitness programs to find the best way to prepare my body. I wish I found out about your company sooner because so far I think your programming is the best I have tried. A large number of guys in my career field have been severely disabled by injuries from years of deployments. I think a lot of those injuries could have been avoided if we were training properly. We have finally opened our eyes to the need for effective mission focused training but unfortunately that sort of programming is not that easy to come by. A friend of mine recommended your company and when I began to research your products I realized it was exactly what I needed. I will be recommending your company to everyone that will listen to me. Hopefully the research and time you guys have put in can better prepare this new generation of military for the future."